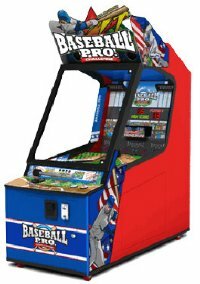 Baseball Pro Arcade is a giant pitch-and-bat baseball arcade game, where players controls a mini-baseball bat and skillfully hit the baseballs rolling down a ramp ! A Play-by-Play Announcer adds to the fun and realism of a real baseball game, while the colorful and vibrant cabinet side art makes this one profitable arcade game. Players use a mounted metal baseball bat lever mounted on the front of the game to "swing" at balls which are “pitched” to the player down the ramp in center field, while aiming the balls to land in one of several targets at the back of the game. These targets light up in either green or red colors, to indicate how many bases the player advances. "1-H" indicates a single base hit, 2-H for double base hit and 3-H for triple base hit, or if they are lucky and land the ball in the moving "Home Run" target, all players on the field score home runs ! But if the player's ball lands in the "Out" target, they score a out, and the game ends when the player gets 3 Outs. ▪ First New Arcade Baseball Game On Market In Years !